Instructions: Prepare a white card base 5 x 7". 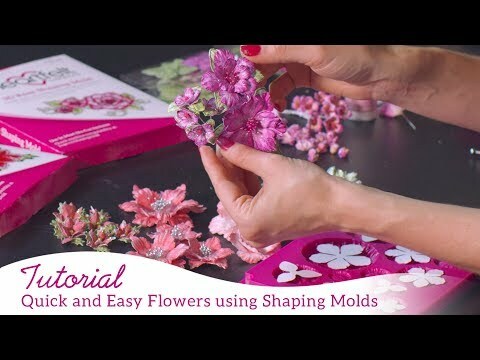 Layer with a piece of the Cherry Blossom Retreat paper 1/4 inch smaller. 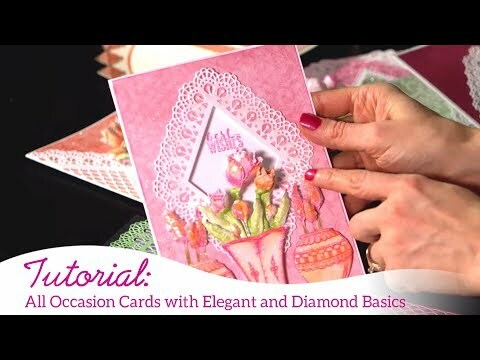 Use white cardstock and cut out one of the decorative Daydreams Bridge dies, adhere to the center of the card. Die cut the Eyelet Diamond Die, add foam dots to the back and adhere to the center of the die cut you just placed. Cut one of the Diamond Basics out of white cardstock, stamp the sentiment in the center, add foam dots and adhere on top of the other triangle. Stamp the Birdhouse on white with the black ink, color using the Prisma Color pencils, cut out with the coordinating die, add foam dots and place on the card on the upper right-hand side. Stamp the branch with the birds on it on white with the black ink, color, cut out with the coordinating die, add foam dots and place on the lower left side of the card. Stamp the birds, flowers and leaves. Color, cut out with the matching dies, place in the mold, run through your die cutting machine, arrange around the card as shown. To finish the card, add glitter and Crystal drops.